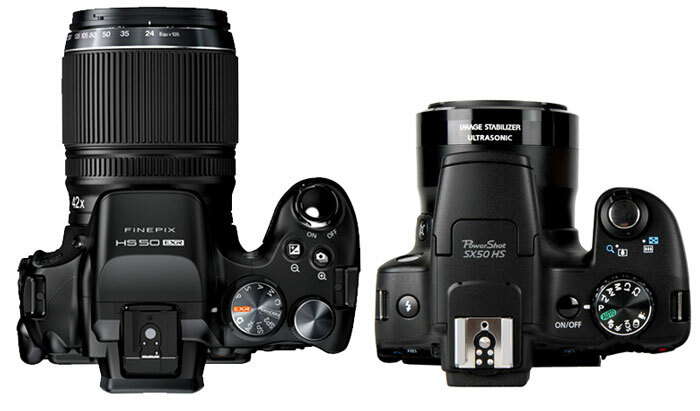 Fujifilm HS50 vs Canon SX50 HS specification comparison review, take a look below and share your thoughts with us. Fujifilm HS50 features newly developed ½” EXR CMOS II sensor with phase detection and Canon SX 50HS features 12MpCMOS sensor, if we compare the Size Fuji have bit bigger sensor, more megapixel and more ISO range compared to Canon SX50 HS, So specification says that Fuji have better sensor. Canon features 8.3X more optical zoom than Fuji, So Canon wins here. Fuji features traditional Lens Shift IS whereas Canon Features advance Hybrid Image Stabilization, Intelligent IS to automatically select from six different modes to optimize image stabilization for the given situation: Normal, Panning, Macro (Hybrid) and Tripod IS for stills; and Dynamic, Powered, Macro and Tripod IS for video. The newly announced Fujifilm features Phase AF points within the sensor, due the Phase AF points and contrast detect AF system the Fuji HS 50 achieves a blazing fast AF speed of 0.05Sec, Canon SX50 HS AF speed is limited to 0.19 sec with contrast detect AF system. With Canon SX50 HS You’re free to use the full range of the zoom in movie mode, and sound is recorded in stereo. Canon SX50 HS frame rate is limited to 30 fps at Full HD while Fujifilm offers you better AF system and 60fps frame rate while recording video. Display: Fujifilm HS50 features big and high resolution display. Battery Life: Fuji HS50 gives you more battery life. Canon have NB-10L Rechargeable Lithium-Ion Battery Pack, 7.4VDC, 920mAh , Fuji have 1x NP-W126 Rechargeable Lithium-Ion Battery Pack, 7.4VDC, 1300mAh. Size and Weight: Fuji is bit bigger and heavier compared to Canon SX50 HS. Fuji HS50 Image processor is fast compared to canon in overall score. Canon is bit lightweight and smaller compared to Fuji HS50. 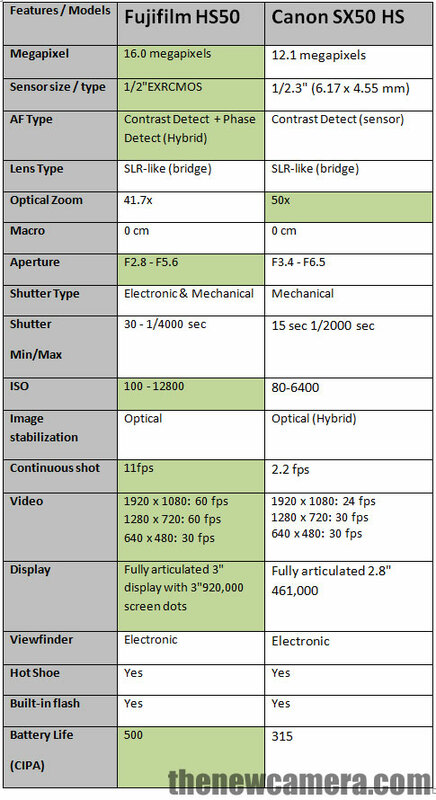 If you are looking for Mega zoom camera you can buy Canon, Since SX50 HS features 8.3X more optical zoom than Fuji HS50 with better IS, but based on overall score Fuji HS50 is a clear winner. I have owned both of these cameras and although the technical specs would seem to favor the Fujifilm HS50 I’ve found from experience that the Canon takes MUCH higher quality pictures in regular conditions. They are both nice cameras, but I like the Canon’s picture clarity and low light ability far more than the Fuji. Neither camera is of course a big full featured DSLR, but they don’t cost $1000s and they don’t weigh the 15 pounds you’d need with this kind of zoom length. Either is a nice portable substitute for a wallet and back breaking DSLR with this much zoom. Edward, I’m not sure how you can make the claim that you have any experience with the Fuji HS50EXR since the camera won’t be released until late March of 2013 and you posted your comment in mid-February. I own the Canon SX50HS and it really is an incredible little camera with a couple of technical limitations that the Fuji will probably resolve. If the Fuji can take similarly good pictures (which remains to be seen) then I think Fuji will have a winner on their hands. Been looking at these bridge cameras for quite a while, maybe too much. But a lot of people say that the Canon with its smaller sensor and less mps has better picture quality than the Fuji HS50EXR.. All the stats say the Fuji is a better camera. Can’t find in the Chicago suburbs to get my hands on. Anyone with any experience with these cameras? Have a great day. Dabs…. HS50. Even though the HS50 has a bigger sensor and stuff..
compared photos and checked both cams myself. To compare the images. The pics of the Fujicam seem to be very unsharp. I think you pay for the features on the HS50.. but on the SX50 you pay for imagequality!